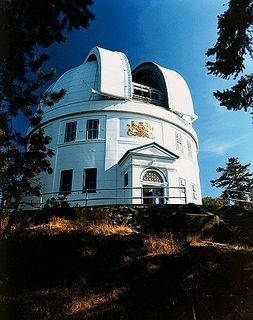 The Dominion Astrophysical Observatory was inaugurated in 1918 at Saanich near Victoria, British Columbia. Its creation was motivated by the growing need of Canadian astronomers to have access to a large world-class telescope. The observatory immediately achieved international status by housing a 1.83-metre telescope that was the largest operating telescope in the world, although it only held this title for a few months. The installation of the telescope was largely the work of celebrated Canadian astronomer John Stanley Plaskett, and the instrument was baptized the “Plaskett Telescope” in his honour. It measured 15 metres long and its mobile parts weighed 42 tonnes. Plaskett became the first Director of the Dominion Astrophysical Observatory and helped it establish an international research reputation very early on. In 1922, for example, he discovered a binary star and the larger of the two still holds the record as the most massive known binary star. This celestial body bears the name of “Plaskett’s Star” in his honour. During subsequent years, Plaskett established the radial velocities of several stars (that is, the speed at which the stars are moving away or toward the observer) and demonstrated that our galaxy, the Milky Way, is rotating. He was also the first to measure the size, mass and rotational speed of the Milky Way. He also established that the Sun is located at 2/3 the distance from the centre of our galaxy to its edge, and that our solar system takes approximately 22 million years to complete one galaxial rotation. In 1940, the Dominion Astrophysical Observatory was the site of two other major discoveries. Andrew McKellar, one of the observatory’s astronomers, became the first researcher to detect the presence of matter in interstellar space when he identified the spectral bands for the organic compounds cyanogen (“CN”) and methyne (“CH”). One year later, in 1941, he determined the temperature of the cyanogen molecules and deduced that the interstellar environment in which they are found is very cold, approximately -270 °C. It was the first direct measurement of the temperature of the Universe. 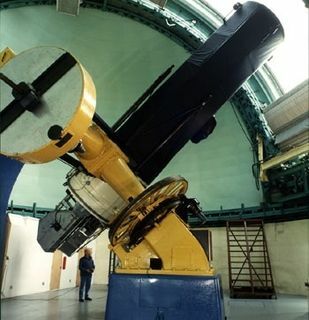 In 1962, the observatory acquired a second telescope measuring 1.22 metres in diameter. Equipped with only a spectroscope, it was mainly used to study binary stars. In 1970, the responsibility of the observatory was conferred to the National Research Council of Canada. 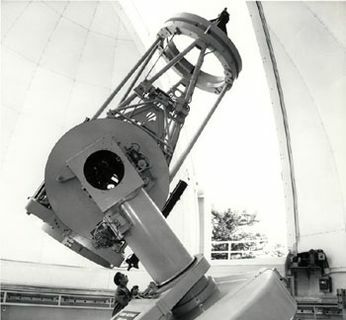 In 1981, the observatory received a third telescope measuring 40 centimetres across. It was primarily used for scientific research, notably the study of gas clouds in our galaxy (the Milky Way), and to test instruments destined for large telescopes. Today it is used to show the sky to the general public. In 1995, the observatory became the headquarters for the Herzberg Institute of Astrophysics, which operates several telescopes (optical and radio) in Canada and shares many others with various countries elsewhere in the world, including the Canada-France-Hawaii Telescope and the Gemini telescopes. In 2001, the observatory inaugurated an interpretation centre open to the general public all year long and affectionately named “The Centre of the Universe”. It includes a small planetarium and offers interactive displays, multimedia presentations and special events designed to introduce people from all walks of life to the world of astronomy. Over the years, new instruments were added and many technical improvements were made to the Plaskett Telescope, the observatory’s main telescope. Today, the Dominion Astrophysical Observatory is the responsibility of the National Research Council of Canada’s Herzberg Institute of Astrophysics.